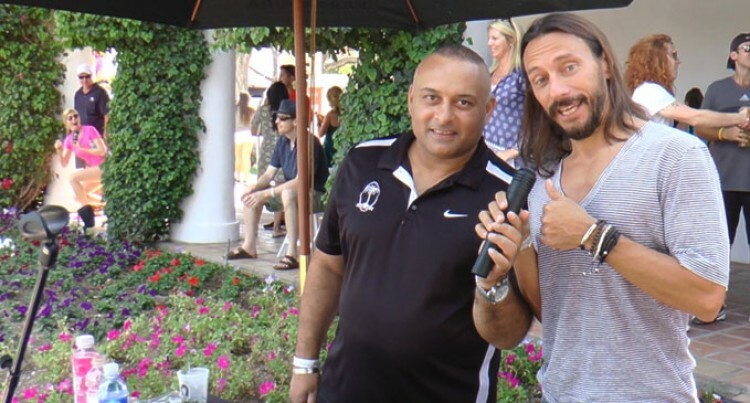 Ajay Bhai Amrit (left) with the music maestro Bob Sinclar. The music maestro Bob Sinclar is known in the music industry as a genius when it comes to house and dance music. He is never more relaxed than when he is mixing his music before crowds of 100,000 plus at outdoor venues across Europe and North and South America. Bob Sinclar was born in May 1969 in Paris, France, and from a young age had a love for various types of music. His love for music continued until he decided that this is where he wanted to pursue his career. Since the beginning of his career in 1998 Bob Sinclar has produced in excess of 14 albums on his own record label called Yellow. He produced the mega hit single called “LOVE GENERATION” that went Gold and recorded number one on the charts in countries across Europe America, Australia etc. This breakthrough put Sinclar on the map and also made him a household name within his peers in the music industry. After this smash hit came another chart topper called “WORLD HOLD ON” these hits plus his many award winning albums have made Bob Sinclar a man in demand. He is sort out to perform at the best dance and house events globally and has performed in front of crowds reaching 200,000 to 300,000 people. Being in demand brings a very tight schedule and sometimes as soon as he has finished one event in a country, he is boarding a private jet to attend his next event. I have admired his music for some time and recently I met up with him to see exactly what makes him the genius on the turntables that millions of fans adore him for. I met up with Bob Sinclair at a posh up market setting in California for my first lesson in mixing. We were at an event that required precision mixing as he was performing within a tight schedule. The first thing I noticed upon meeting him was how laid back and very humble he was. There was no ego or self promotion about him, actually I would go as far as to say he was a gentleman for the whole afternoon that I spent with him. Firstly he tried, and I use the word tried very strongly, as he was patient enough with me to let me make my fair few share of mistakes before I slowly understood that to mix and fade in and out of records while making it sound seamless is no easy feat. In fact it takes a person with a great musical ear and timing to make the music flow and sound beautiful. After some time, as I was getting the hang of this art form, Bob did tell me that I was a natural at mixing. Well after scratching about five of his records and almost breaking one of his delicate turn tables I do feel he was being most generous indeed to heap that sort of praise on me. On a personal note I must say that he is certainly a very accomplished individual who has a great personality, and to be as down to earth and friendly as he is was wonderful to see. Bob Sinclar is an artist in his own field of music and this summer he will be performing in countries like Brazil, America. Australia, Ibiza, UK, France and the Mediterranean etc. We have exchanged email address’s and he has very kindly invited me to a performance in Brazil where an estimated 250,000 people will be attending. I have written back thanking him for his kind invitation and have requested that he lets me loose on his turntables for a few minutes during the course of this mega event. If he says yes the deal is done.